The Enterprise is caught in a temporal causality loop. This episode has the best teaser opening ever. I still remember how I felt when I first saw the Enterprise explode before the opening credits. It's easy to assume that this is a flash forward, especially after the commercial break when we see the ship very much intact and nobody mentions that time where they all died in a fiery explosion, but of course, as the episode goes on, it becomes more and more apparent that there is something much stranger going on. Déjà vu is a tricky plot device, but it's used really well here. I'm glad that Crusher acknowledges late in the story that there is a difference between what is happening and what déjà vu really is, but it's always satisfying to have a story that offers an explanation for such a commonplace phenomenon. Ro feels like a fifth wheel in this one. Despite her promise early on, the writers don't seem to know how to effectively utilize her character anymore. One nitpick that has always bothered me, ever since my very first viewing, is why they can't just do both options presented by Riker and Data. In other words, what's preventing them from pushing the Bozeman with a tractor beam and decompressing the shuttle bay? The explosions are so cool. It's cool that every loop is different in multiple ways. Even scenes that are nearly identical are shot differently, with cinematography that gets more and more extreme as the show goes on. By the last loop, the camera is pulling back to the floor at an angle or sitting high up above the conference table. This episode is similar to "Remember Me," in that it's a puzzle show largely in Crusher's POV. Why does Nurse Ogawa think it's weird that La Forge walks into Sick Bay immediately after Crusher calls her to ask if he's there? From Ogawa's perspective, it would simply seem as though Crusher sent La Forge to Sick Bay and was just checking to see if he'd arrived yet. There are some minor timing issues. La Forge appears in Sick Bay at different times, if you clock it using the poker game as a baseline, and in the final loop, the Enterprise encounters the anomaly while the crew is still in the conference room, even though the previous loop had the red alert much later. La Forge: "This is gonna sound pretty wild." Again with the second-guessing?! 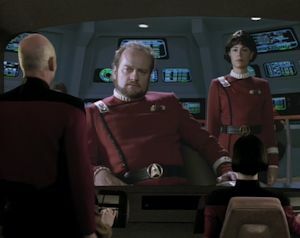 Worf suggests that, in order to break the loop, they should just turn the ship around, but his idea is shot down because they shouldn't start "second-guessing" themselves. Just like a similar bit of exposition in "Time Squared," the logic is terribly flawed, only here, it's even more obvious! If turning around is what causes the loop in the first place, as Riker suggests, why would they have turned around the first time? Why does Data use "three"? Wouldn't "Riker," a word that uses just as many characters, have made more sense? Perhaps he only had time for one character, so he chose "3," but again, "R" probably would have been more logical. The Enterprise is in the loop for 17.4 days, during which the déjà vu gets progressively worse. The Bozeman is in the loop for over eighty years, and yet the crew is totally surprised to discover that anything strange has been happening. If the Enterprise crew could figure it out in 17.4 days, why couldn't the Bozeman crew figure it out in 80 years? It's possible that their loop is much shorter, that maybe their entire loop is constrained to the slightly less than a minute between emerging from the anomaly and crashing into the Enterprise, but if that were the case, they'd have repeated their loop tens of millions of times. That means they'd have ridiculously intense déjà vu on par with Bill Murray in Groundhog Day. Of course, this brings to light all kinds of secondary questions: where does the Enterprise loop start, exactly, and does the Bozeman loop end with the collision as the Enterprise loop does? How did the Bozeman loop run for 80 years before the Enterprise entered the Typhon Expanse? This is one of those premises you pretty much just have to accept, because you can drive yourself crazy if you try to think about it too much. TNG, in episodes like "Yesterday's Enterprise" and "A Matter of Time," has been doing a good job taking unique approaches to time travel. This story is a natural extension of some earlier ideas that weren't quite as successful, such as the second season's "Time Squared." That episode presents "the theory of the Mobius, a twist in the fabric of space where time becomes a loop," but the loop in question is pretty lame and easily broken. Here, the writers take their idea a step further by introducing a recursive loop (a "temporal causality loop"), and in so doing, they tap into a clever new way of telling a story. Granted, character development takes a distant back seat, but the narrative uniqueness more than makes up for it. I friggin love this episode.